The firm was originally founded by Francisco Girbau in Igualada (Barcelona) in c.1830. After being handed down from father to son it became Francisco Girbau & Cia. The business was relocated to Buenos Aires in 1890 and operated from the addresses shown above, which can also be found on the fours of cups. 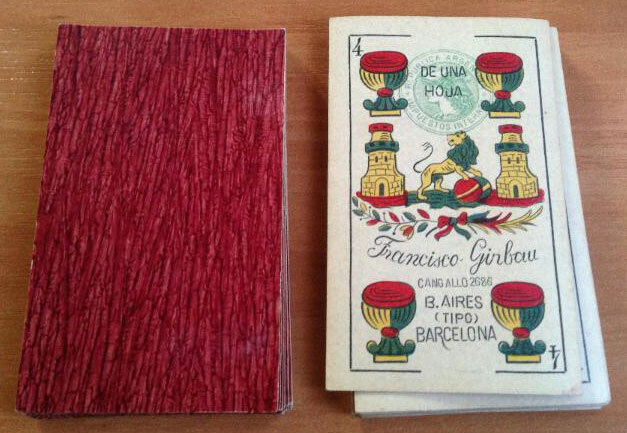 Above: four cards from a 40-card pack made by Francisco Girbau, early 1900s, printed by colour lithography and with square corners. The black 'Mercury' tax stamp on the four of cups was used during the period 1895-1905 (approx.). The address is given on the four of cups as Piedad 2260. 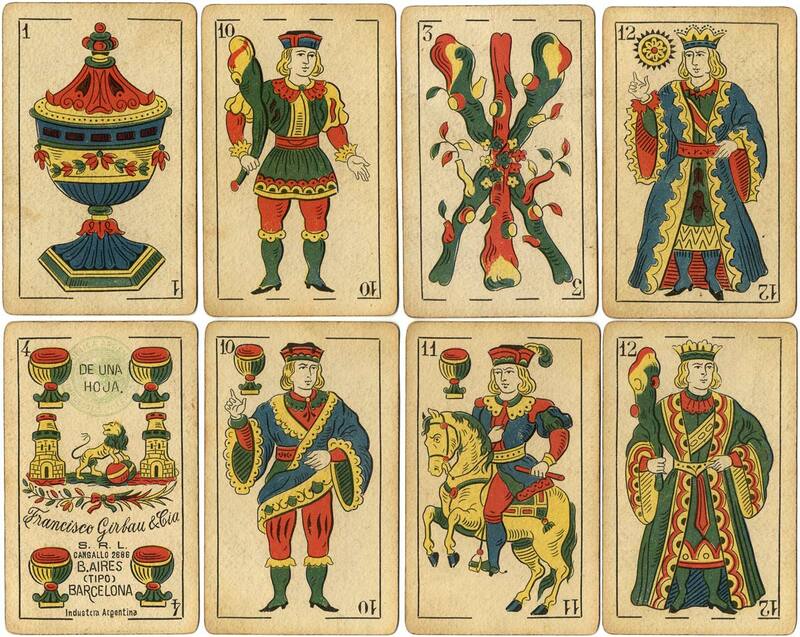 The inscription "Tipo Barcelona" on the four of cups refers to the Spanish Catalan pattern which is associated with Barcelona and which became popular in several South American countries. The same designs were subsequently used by Fourvel and Cappellano. Above: four cards from a 40-card pack made by Francisco Girbau & Cía, S.R.L., c.1930s, printed by colour lithography and with rounded corners. The green 'Mercury' tax stamp (second version) on the four of cups is from the period c.1920-1945. The company name has changed to a limited company, and address given is Cangallo 2686, B. Aires. 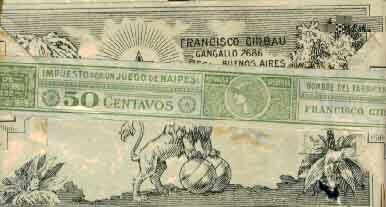 The legend 'Industria Argentina' also appears at the bottom of the four of cups. Thanks to Maria Marcet for information about her family ancestors.